On July 15, the first commercial planes to use Biofuel in Africa, carried 300 passengers between Johannesburg and Cape Town, South Africa (SA), according to CNN. These jets were powered by nicotine-free, high energy “Solaris” tobacco plants cultivated in Limpopo Province. 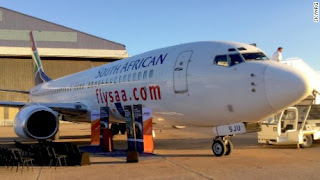 According to SAA Group Environmental Affairs Specialist “This is very significant as it proves we can use this biofuel……We don’t need to buy dollars or oil, so we will not be hostage to oil price variations”. He also added that the increased production of Solaris plants would also create thousands of jobs. The Solaris crop is projected to offset 267 kilotons of CO2 emissions a year by 2020, says Maarten Van Dijk, SkyNRG chief technology officer. “We can also deliver biodiesel for cars and bioplastics" says Sunchem SA Managing Director, Dr. Joost Van Lier. He also added that the Solaris crop offers new opportunities for farmers in South Africa that have suffered due to the falling demand of tobacco, as smoking prevalence in SA decreases. This Solaris tobacco plants is both environmental and economy friendly. Nigeria should look into other sources of fuel, so we don’t have to depend on oil alone as our source of fuel. If they can accomplish this in South Africa, am sure the “Giant” of Africa can also accomplish this too.